Anti-lag is a very interesting technology that came about in the 1980s when rally cars started to use turbochargers. To fully explain it, first I have to explain what lag is, and why it occurs. An engine is an air pump, and the more air that goes into a motor, the more power it will make. The primary factors that determine how much air is flowing through an engine are displacement and RPM (although in reality it is a little more complicated). As engine speed increases, so does the amount of air that goes through the motor. The same goes for displacement: a bigger engine moves more air and makes more power. Most of the time, we don’t have much room to increase displacement or revs. This is where forced induction, and the turbocharger comes in. A turbocharger is a compressor spun by exhaust gasses. The purpose is to both reclaim some of the lost energy from the exhaust, increasing efficiency, and to increase the pressure of the intake air. Forcing more air (and the corresponding extra fuel) into the engine means that you can make more power with less displacement. The downside is that it takes some time for the turbo to get going, especially when you are using a large turbo to make a lot of power out of a small displacement engine. Until the engine is moving enough air to spin the turbo, you’re stuck with a low displacement motor with low compression and no boost. This is called turbo-lag. In some cases you can compensate for the lag by increasing the revs to give you a larger in-boost powerband, but you still have that dead spot at low revs and higher engine speeds mean much higher stress on the engine components. Additionally, many racing classes require the use of an intake restriction, which limits the amount of air that can be drawn in, and therefore limits the maximum power and useful rpm range. These inlet restrictors will actually cause lag on all their own due to the fact that the turbo has to draw air through a smaller size hole. The most simple form of anti-lag, used in the 80s, was to never lift off the throttle. This kept air going through the engine and the turbo spinning, but resulted in significant wear on the brakes and transmission, especially given that some rally cars were making over 600hp. Soon, systems were created to keep the turbo on boost even when the throttle was lifted. To generate the low end power and response required by a rally car, it’s necessary to have the turbo spinning as soon as possible, creating boost before the driver actually presses the throttle. The simple way to do this is to keep the throttle partially open so plenty of air is going through the motor, dump a bunch of fuel, and then wait until the super-rich air fuel mixture is on the way out the cylinder before igniting it. Instead of having the combustion event force the piston down to make power, it explodes going into the turbo, creating boost. 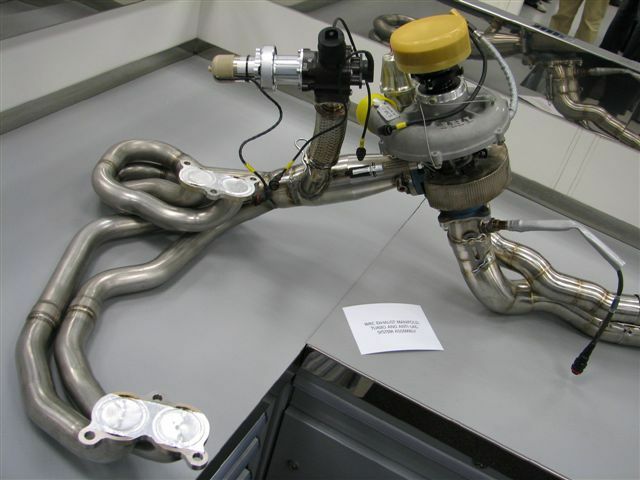 That little doohickey attached to the up-pipe is known as “the rocket.” A canister connected to the charge pipes stores pressurized air, and when the throttle is closed an air/fuel mixture is ignited in the rocket, spooling the turbo. This allows the 2.0 Subaru WRC motor to create useful boost (and 200hp) at the idle speed of 2000 rpm. By 2500 rpm the manifold pressure is 30psi, and reaches a maximum of 45psi by 3000 rpm. Peak torque is 520 lb-ft, and a little over 300hp is available from 3000 to the 7500 rpm redline. The important part about this system is how precisely it can control turbo speed and boost. By using a turbo speed sensor, this system is much more efficient, and allows more manifold pressure at lower revs with less wear to the exhaust components and turbo. Hi, I have an M52 e30 thats boosted and I was looking to run some sort of anti-lag. The car is a track/ street drift car and the anti-lag function in my ECU can be activated with a switch. I’m aware that anti-lag will raise your EGTs and shorten the life of your turbo due to excessive heat and uncontrolled overspinning, but my real question is what harm can anti-lag do to your motor? Can it easily bend your exhaust valves? I have an EGT input on my ECU and can monitor the temps very easily, but what does it take to bend an exhaust valve? Too much heat? Too much force? I want to start more mild and eventually do something crazier. Any input is appreciated!